WELCOME TO THE TOP OF THE ROCK! For 43 years many US-Soldiers and their families lived in the large military complex up in the Rhoen-Mountains in northern Bavaria. During this time of the "Cold War" many Americans and Germans became friends, many women became wives of American citizens and left their homes to follow their husbands to the United States. After all those years and the hardships they brought with them, the American presence in our area is not forgotten. 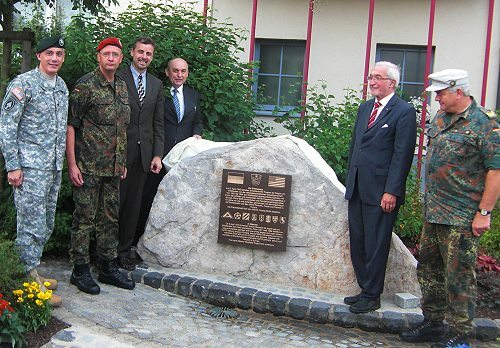 19 years after the last US soldier left Wildflecken, on 26 July 2013 the City of Wildflecken dedicated a commemorative plaque to remember the "American Era" of Wildflecken.